Veiled in shadow, the eyes and mouth seem to tell us that in this way, as if guided by a blind, instinctive force, this woman is the prototype of the mother, that wonder of nature which watches over and cares for her children, without favouring one other another (the child's eyes are thus obscured as well, de-emphasizing her own individuality). With an attitude of great discretion, from behind and half-submerged in the background, the mother's body envelops her daughter, sheltering and guiding her, protecting her from all hazard and doubt. 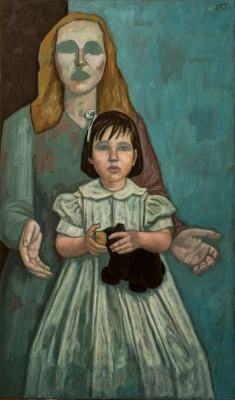 The figure of the daughter appears as if radiating from the mother's own affection (note the slanting line which starts at the head of the woman, descends along her hair and left arm and is extended in the edge of the child's skirt).